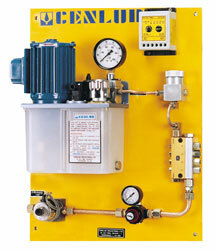 When the mist required is of high pressure and high velocity, typical type of mist lubrication unit is available. In this system oil is fed to the nozzles at a pressure of 30kg/cm2 while air pressure is 6kg/cm2. Because of this, high-pressure mist is formed under high velocity. This system is of-course for intermittent application. The cycle time is governed by timer/switch. But frequency can not be less than 1/2 minute. The flow of air and oil both are adjustable (preset). Maximum number of nozzles can be attached to the unit are six. This system is best suited for conveyors, chains & spindle machine slides as well as high speed machine i tool.